Whether you’re looking for corporate entertainment, the perfect hen do or something to celebrate that special birthday, we use our exclusive murder mystery scripts, dedicated party planning team and enthusiastic hosts to make your party one to remember. Our writing team creates exclusive scripts that add a fresh twist on classic murder mystery themes. Each story boasts flamboyant characters, hilarious plot lines, and enthralling games that build up to a thrilling revelation. We also don’t use actors so you can fully immerse yourself in our light hearted and entertaining activities whilst having fun playing detective. 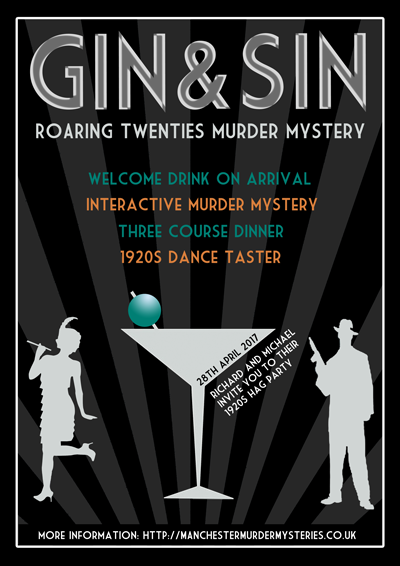 We’ve chosen the best restaurants and suppliers in Manchester to perfectly compliment your murder mystery party. 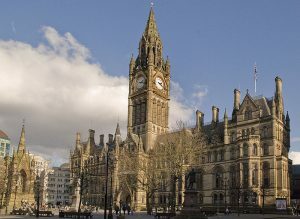 Our murder mystery venues are specifically chosen for their uniqueness, style, and attention to detail, guaranteeing exceptional service every time. We wouldn’t bring a party anywhere that we wouldn’t want to spend time in ourselves. Our dedicated party planning team is ready and waiting to arrange for you an event to remember. We source the perfect venue and arrange all the little details so all you need to do is tell us the occasion, choose your theme, and then show up on the night ready to play. Sound fun? Find out more. "Thank you for a fantastic night, everyone enjoyed themselves and are still talking about it now. I would certainly use you again and recommend you." …our ‘Gin & Sin’ theme for your party! Say the password and come on in.